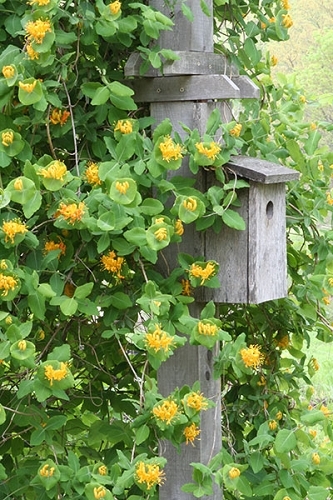 Yellow honeysuckle is a twining vine with very showy, fragrant flowers. Red or orange-red fruits appear in August/September and are dispersed by birds. Edibility or toxicity for people is unknown. Deer may browse the stems and leaves, but they're unlikely to destroy the plant. It is a good specimen for a trellis or arbor and a much better choice than the invasive Japanese honeysuckle and bush honeysuckle. 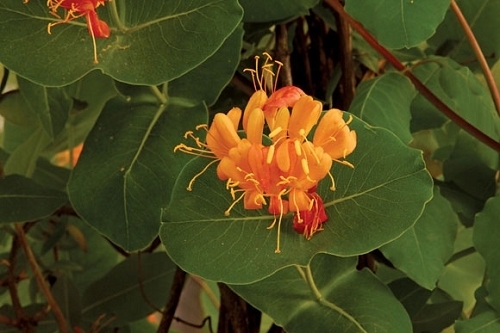 Seed is usually unavailable, but yellow honeysuckle is generally pretty easy to grow from seed. Remove the seeds from the juicy pulp and rinse them well. Sow immediately and barely cover the seeds to depth; you don't need to bury them. Leave outdoors over winter (protected from varmints). Some germination will occur right away; most seed will germinate the following spring.